It wouldn’t be normal for the Numpties to download what was, in effect, a carte blanche, with clues that have no word lengths and to read that ‘the grid is made up of square cells, not all of the same size … ‘ without a mighty grumble. There was the redeeming feature that ‘clues are given in conventional order’ but then we had that so familiar ‘the wordplay leads to the answer with an extra letter that is not entered in the grid’. Oh dear! Of course I checked Stan’s continued membership of the Listener Setters Oenophiles Society and although he gave me initial concern with ‘Inclination to get high put out near conclusion’ (PU[T* END = UPTREND) and followed that by ‘Lament one from Perth entering house of disrepute’ ([A]E in KEN giving KEEN) he seemed to be yielding to the need for a drink with ‘Hesitancy built up amongst teetotallers? (BUIL[T]* in AA giving ABULIA – loss of willpower). Yes, the willpower was clearly gone as Stan then told us ‘Vintage measure of Champagne quietly discovered in rustic tavern’ (Giving us TA[V]ERN* around P so the measure was just any old French plonk or even soil) then we had a stimulant, ‘Stimulant — extract of cantaloupe, perhaps’ Hidden UPPER with an extra E. No wonder Stan was ‘Slightly drunk, Earl travelled round missing first left’ (another anagram giving us ELEVATED with an extra R. Well, Cheers, Stan, see you at the bar! So at last it all made sense. ‘VERSAL IN LARGEST CELL’ Those six-letter words that shared an initial A were going to share a large illuminated letter A, and since the grid was to be symmetrical about the NW-SE diagonal, once we had those four words (AUREUS, APERCU, ABULIA and ARPENT) in place, the rest of the words paired off nicely and filled the grid. I was so excited that at last we had a grid fill, that I almost overlooked that last requirement. ‘Solvers must also highlight a thematic three-word title in the grid. It was, of course, obvious what I was looking for but it took me surprisingly long to find it BOOK OF KELLS so neatly symmetrically crossing the grid just below the other diagonal. What a clever and attractive compilation, Stan. Many thanks. Isn’t The Book of Kells one of the most amazing pieces of artwork? As many of you will know (and certainly by the time you read this) it’s on display in Trinity College Dublin. I nearly got to visit it once – and definitely one for my list. Having seen facsimiles of many of the plates I’d recommend a visit it to you all, if you are anywhere even vaguely nearby (same continent, perhaps?). So, on to Stan’s delightful puzzle. Once some of the across clues were solved then ‘Illuminated Manuscript’ looked a very likely candidate for the two-word description. But the rest of the hidden phrase seemed much harder to crack. really threw me initially. I assumed correctly that the definition must be ‘Poor’: my first guess at the answer, which I then tried to ‘parse into place’ was MEAGRE. Could I shoehorn ME (Most Excellent) + AGRE[E] in somehow? ‘Agree’ and ‘relation’ are similar? Answer: maybe but not similar enough. When I then stumbled on NAN as the possible relation (yes, there’s no Def By Example indicator, I know, I know), then I foolishly thought ME [N]AN gave MEAN and I put N aside as the added letter. When the hidden letters for the ‘something that must appear therein’ began to look like “…LARGEST C? ?N” I was stumped. COIN for Corner in a French illuminated manuscript, perhaps?? Eventually I guessed CELL, then spotted that this last clue was actually MERE and parsed as ME RE[L]. …I wonder? There seemed to be so many possible ways to parse it! I tried UPEND but that didn’t quite work; I then tried TREND which again didn’t quite account for all the wordplay; and eventually I combined the two and went with UPTREND. And finally, the Title? I guess one of the most well-known ways of testing for acid is using LITMUS; add a bit of commonness, i.e. non-U, and this becomes LIT MS.
Illuminated (LIT) + ManuScript (MS) – simple, eh? Loved it – thanks Stan! This week we had Stan’s third Listener although six years have passed since his last, No 4111, News Quiz. That had as its theme the fact that Alaska is the most northerly, westerly and easterly of the American states (it straddles the date-line), with Hawaii as the southernmost. Here a blank grid stared at us… almost literally. The grid needed to be contructed by us with square cells, not all of the same size. The clues were in normal order and were of the extra wordplay letter type. The extra letters would spell out what the finished grid would represent and need to contain. Since the grid was symmetrical about the NW–SE diagonal, the number of across and down clues would be the same, ie 20. That meant the first down clue was Hesitancy built up amongst teetotallers? Oh dear, Shirley, an ex-alcoholic! That was ABULIA, but would have to wait till I scanned all the acrosses first. That proved worthwhile, with the first three, AUREUS, APERCU and HERB, being scribbled separately from the grid. I applied a bit of logic to the situation, with the expectation it would be wrong. If AUREUS and APERCU were along the top row, then where would HERB go? I decided to delay any more logic until I had finished scanning the acrosses and downs. That proved depressing, with only KEEN, OBELI, SCELERATE and GALA being solved across. The downs were slightly more promising: ABULIA, UPPER, RED DEER, IBSENITE and a handful of others. So, back to the logic, and it looked as though the top left square would be 2×2 and contain A. That would enable ABULIA to use that square with UPPER dropping down from AUREUS and APERCU. My money was on the bottom right being 2×2 as well. I wondered how many other 2×2 squares would be lurking in the grid. As I solved Assailant mother stabbed with nail for ATTACKER, the extra wordplay letters that I had read ILL…A.E.M…, and Illuminated Manuscript was a relatively easy spot. Next came ARPENT and BREED, but they messed with UPPER and RED DEER, so perhaps we had a 3×3 square in the top left corner. And bottom right? Luckily a bit of thought made me reaise what we were dealing with. Well, the extra letters had actually told me, and it was more likely that the top right square would be the ‘illuminated’ bit of the diagram. So I guessed that just a large letter A like the one that was currently in my grid, would be inadequate. Something a bit more ornate would be required, but there was no ‘solvers will not be penalised for lack of artistic ability’ in the preamble. I decided to leave the really flamboyant stuff to Shirley and just made mine ever so slightly flamboyant for my submission. Chambers gives acid test as a test for gold. I assume the title is therefore a reference to gold leaf frequently being used in illuminated manuscripts, but I’m not 100% sure of this. A very enjoyable and novel puzzle, thanks Stan; luckily not as daunting as the grid at first made it seem. It appears that there’s hard … there’s really hard… then there’s Sabre’s “Out of Line”. Perhaps apart from one or two in the depths of winter that sleep deprivation on the overnight Eurostar ski train has almost entirely successfully blotted from my memory, this feels like the toughest of 2016 so far. After solving a few clues, the only clear way to ensure the clues successfully ‘check’ appears to be to assume they all have to be entered as jumbles of the answers. But won’t that require cold-solving of (almost) all 40 clues? That sounds a really tough slog! Is there something else (easier?)? Surely there is. One of my earliest spots was noting the preponderance of Js (in fact, now I stop to look harder, of Japan). I wondered if that was relevant. I’d luckily solved most of the SE corner early on – CLOCHE, REIKI, PINAS, DUMPLING, SACQUE &, by a stroke of good fortune, IRUKANDJIS. Given some of these crossing words had only one letter in common, I felt I was probably on safe ground putting those common letters in. With a couple more added it was beginning to look like the first letter was moving to second place – ECLOCH for CLOCHE for example. Perhaps it was Biblical, Buddhist, StarWars-ian (or even Hessian? )… with the last becoming first? Perhaps that might be called BASE-JUMPING, at a stretch? Only 11 letters though. What about one or two answers where it seemed the fourth letter was jumping to the front. Did it involve a TRIPLE JUMPER, perhaps? But at 33d DOG has become ODG. So no appearance fees for Jonathan Edwards (even though at least eight clues did prove to be treated (by chance) with the method of the TRIPLE-JUMPER. There proved to be at least 12 cases of BASE-JUMPING too). Maybe just any random letter goes to the front? Hmm. Horrendously slow! After 24 hours had passed I had cold-solved only about a third of the clues and had only eight (yes 8!) out of 144 characters firmly in the grid. However, it did look as if it could well end in -ous. So how many 12-letter words are there in Chambers that begin di- & end -ous (seven, I hear you cry in unison!). Of these, only DISANALOGOUS, DISCOURTEOUS, DISINGENUOUS & DISPUTATIOUS look as if they could have even the slightest connection with the Title. Looking at the other letters I had as options, and knowing that some were due to change, it still looked much more like DISCOURTEOUS than any of the others. So if it was, then what letter changes would be needed? 12a’s R in the third letter-slot would need to change to an S (R->S) for example. If it was a random letter moving to the front then I also had likely changes of J->U, E->R and P->E. not many words fit that requirement – but JUMPERS does! Only seven letters though. The only 12-letter relevant word I could quickly come up with was QUEUE-JUMPERS (which, surprisingly, doesn’t appear to be in my BRB version – it’s in the ODE though), which certainly ties in with DISCOURTEOUS and with LINE in the Title. [Returning to an earlier theme it also ties in with French ski lift ‘queues’ too ;-)] Let’s assume those are true for now and see how it progresses. Once I’d assumed that there was always one letter that pushed its way to the front of the queue/line/word, then fitting the words together could, by comparison with half an hour before at least, now have featured on #GBBO. This still left the SW corner looking distinctly snow-covered, with a lot of white to be seen. It had now got past 8 a.m. on the Monday and I still had seven unsolved. Swallowing my pride, I sealed up the envelope which had been waiting optimistically with Hedge-sparrow’s excellent puzzle from the previous week in it and, instead of sending in two at once, felt duty bound to send in L4417 alone. In Listener terms that pretty much defines for me what Sherlock Holmes would have called ‘a three pipe problem’- this, for me at least, is hard! it took me what seems like forever to double-check in the BRB that there wasn’t an obscure meaning of ‘with’. And there it was – BOOM-IRON! I was off again! My lack of recall about Holst’s the Planets meant I spent ages identifying NEPTUNE as the Mystic in question in 22d. And I spent too long in a rut automatically translating the word ‘online’ in 23d into ‘e…’. At the time of writing I still have one not fully parsed at 26a (whose definition I love) but it must be right and it’ll hopefully come to me. Can it really be Spanish-speaking on Peru’s Mount Veronica? I may well be missing something! 12 noon on Monday – finished! “Styles of calypso, American soul being introduced (5)” – what a superb clue (SOCAS). “For one of rats you need 100 cats, say (8)”, another brilliant disguise of both definition and wordplay, just the sort of clue I enjoy, along with its clever TRA(i)TORS with C for I wordplay. I’d double checked Macavity et al, and the Pied Piper, just in case there was a quote I’d forgotten, before I got this one. And finally, the finale. Just to keep the solver on his/her toes, Sabre has included two clashing cells on that leading diagonal. In the first (the first letter of 22d), J or E need to turn into a U. In the second (the fifth letter of 24d), J and (either Q or U) need to turn into a U. The last line of the Preamble reads ‘must be replaced by a letter that immediately follows it…’ so, even though the second needs to be a U by the end, it gets there by firstly being a Q. This means the first letter of 24d has to be a U. And if that doesn’t catch at least one poor soul out – who has relaxed after seemingly getting over all the difficult hurdles only to trip on the final straight – then frankly I’d be amazed. And the whole of the assumed QUEUE-JUMPERS from earlier (including Q->U and E->U) is now justified. Great puzzle, but definitely not for the faint-hearted: I’m now off to watch Only Connect for a bit of light relief. Loved it: thanks Sabre!! P.S. If you’d like to try one of my 15×15 cryptics, I had another published today (at the time of writing) on Big Dave’s Rookie Corner. All feedback on that welcomed. “‘Sabre meets tautog’ perhaps summarises this jaw-breaking beast (9)”. 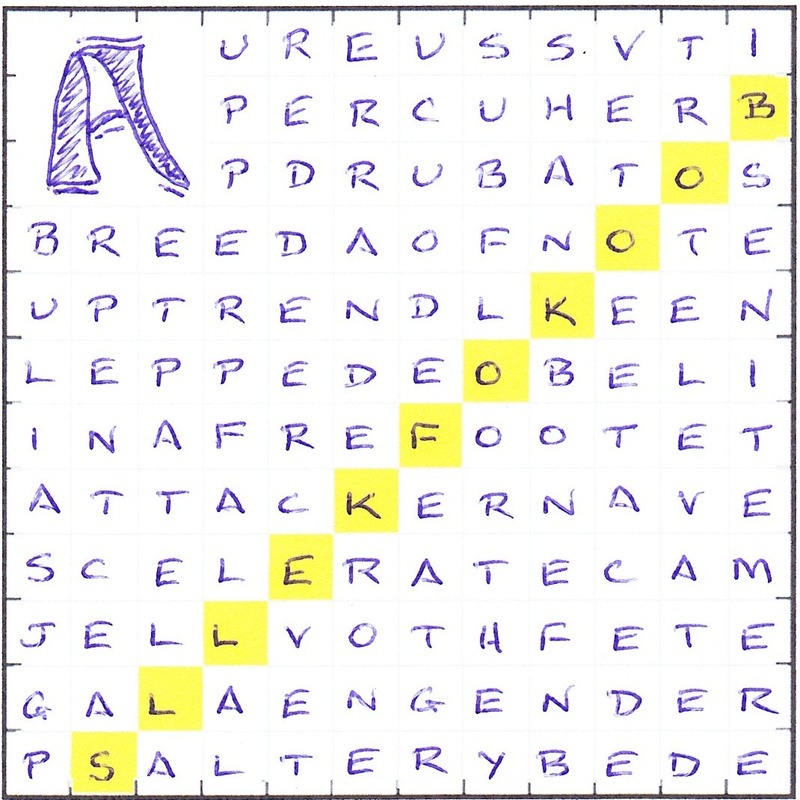 Whether this is best as a clue for SWORDFISH, or should have been enumerated as (9, three words) for this puzzle ‘OUT OF LINE’, I’ll let you the reader decide.